Behavioral epigenetics is the field of study examining the role of epigenetics in shaping animal (including human) behaviour. It is an experimental science that seeks to explain how nurture shapes nature, where nature refers to biological heredity and nurture refers to virtually everything that occurs during the life-span (e.g., social-experience, diet and nutrition, and exposure to toxins). Behavioral epigenetics attempts to provide a framework for understanding how the expression of genes is influenced by experiences and the environment to produce individual differences in behaviour, cognition, personality, and mental health. Environmental and epigenetic influences seem to work together to increase the risk of addiction. For example, environmental stress has been shown to increase the risk of substance abuse. In an attempt to cope with stress, alcohol and drugs can be used as an escape. Once substance abuse commences, however, epigenetic alterations may further exacerbate the biological and behavioural changes associated with addiction. Even short-term substance abuse can produce long-lasting epigenetic changes in the brain of rodents, via DNA methylation and histone modification. Epigenetic modifications have been observed in studies on rodents involving ethanol, nicotine, cocaine, amphetamine, methamphetamine and opiates. Specifically, these epigenetic changes modify gene expression, which in turn increases the vulnerability of an individual to engage in repeated substance overdose in the future. In turn, increased substance abuse results in even greater epigenetic changes in various components of a rodent's reward system (e.g., in the nucleus accumbens). Hence, a cycle emerges whereby changes in the pleasure-reward areas contribute to the long-lasting neural and behavioural changes associated with the increased likelihood of addiction, the maintenance of addiction and relapse. In humans, alcohol consumption has been shown to produce epigenetic changes that contribute to the increased craving of alcohol. As such, epigenetic modifications may play a part in the progression from the controlled intake to the loss of control of alcohol consumption. These alterations may be long-term, as is evidenced in smokers who still possess nicotine-related epigenetic changes ten years after cessation. Therefore, epigenetic modifications may account for some of the behavioural changes generally associated with addiction. These include: repetitive habits that increase the risk of disease, and personal and social problems; need for immediate gratification; high rates of relapse following treatment; and, the feeling of loss of control. Evidence for related epigenetic changes has come from human studies involving alcohol, nicotine, and opiate abuse. Evidence for epigenetic changes stemming from amphetamine and cocaine abuse derives from animal studies. In animals, drug-related epigenetic changes in fathers have also been shown to negatively affect offspring in terms of poorer spatial working memory, decreased attention and decreased cerebral volume. Epigenetic changes including hypomethylation of glutamatergic genes (i.e., NMDA-receptor-subunit gene NR3B and the promoter of the AMPA-receptor-subunit gene GRIA2) in the post-mortem human brains of schizophrenics are associated with increased levels of the neurotransmitter glutamate. Since glutamate is the most prevalent, fast, excitatory neurotransmitter, increased levels may result in the psychotic episodes related to schizophrenia. Epigenetic changes affecting a greater number of genes have been detected in men with schizophrenia as compared to women with the illness. Several studies have indicated DNA cytosine methylation linked to the social behavior of insects, such as honeybees and ants. In honeybees, when nurse bee switched from her in-hive tasks to out foraging, cytosine methylation marks are changing. When a forager bee was reversed to do nurse duties, the cytosine methylation marks were also reversed. Knocking down the DNMT3 in the larvae changed the worker to queen-like phenotype. Queen and worker are two distinguish castes with different morphology, behavior, and physiology. Studies in DNMT3 silencing also indicated DNA methylation may regulate gene alternative splicing and pre-mRNA maturation. ^ a b c d e f g h i Miller G (Jul 2010). "Epigenetics. The seductive allure of behavioral epigenetics". Science. 329 (5987): 24–7. Bibcode:2010Sci...329...24M. doi:10.1126/science.329.5987.24. PMID 20595592. ^ a b c d e f Powledge T (2011). "Behavioral epigenetics: How nurture shapes nature". BioScience. 61 (8): 588–592. doi:10.1525/bio.2011.61.8.4. ^ Kail RV, Barnfield A (2011). Children and Their Development, Second Canadian Edition with MyDevelopmentLab. Toronto: Pearson Education Canada. ISBN 978-0-13-255770-2. ^ a b c d e f g Moore DS (2015). The Developing Genome: An Introduction to Behavioral Epigenetics (1st ed.). Oxford University Press. ISBN 978-0-19-992234-5. ^ a b Champagne FA, Mashoodh R (2012). "Genes in context: Gene-environment interplay and the origins of individual differences in behaviour". Current Directions in Psychological Science. 18 (3): 127–131. doi:10.1111/j.1467-8721.2009.01622.x. ^ Zhang TY, Meaney MJ (2010). "Epigenetics and the environmental regulation of the genome and its function". Annual Review of Psychology. 61: 439–66, C1–3. doi:10.1146/annurev.psych.60.110707.163625. PMID 19958180. ^ Bagot RC, Meaney MJ (Aug 2010). "Epigenetics and the biological basis of gene x environment interactions". Journal of the American Academy of Child and Adolescent Psychiatry. 49 (8): 752–71. doi:10.1016/j.jaac.2010.06.001. PMID 20643310. ^ a b Stuffrein-Roberts S, Joyce PR, Kennedy MA (Feb 2008). "Role of epigenetics in mental disorders". The Australian and New Zealand Journal of Psychiatry. 42 (2): 97–107. doi:10.1080/00048670701787495. PMID 18197504. ^ Mill J, Tang T, Kaminsky Z, Khare T, Yazdanpanah S, Bouchard L, Jia P, Assadzadeh A, Flanagan J, Schumacher A, Wang SC, Petronis A (Mar 2008). "Epigenomic profiling reveals DNA-methylation changes associated with major psychosis". American Journal of Human Genetics. 82 (3): 696–711. doi:10.1016/j.ajhg.2008.01.008. PMC 2427301. PMID 18319075. ^ Rana, Ajay Kumar (24 January 2018). "Crime investigation through DNA methylation analysis: methods and applications in forensics". Egyptian Journal of Forensic Sciences. 8 (1). doi:10.1186/s41935-018-0042-1. ^ a b Pennisi E (Aug 2001). "Behind the scenes of gene expression". Science. 293 (5532): 1064–7. doi:10.1126/science.293.5532.1064. PMID 11498570. ^ Juliandi B, Abematsu M, Nakashima K (Aug 2010). "Epigenetic regulation in neural stem cell differentiation". Development, Growth & Differentiation. 52 (6): 493–504. doi:10.1111/j.1440-169X.2010.01175.x. PMID 20608952. ^ Ma DK, Marchetto MC, Guo JU, Ming GL, Gage FH, Song H (Nov 2010). "Epigenetic choreographers of neurogenesis in the adult mammalian brain". Nature Neuroscience. 13 (11): 1338–44. doi:10.1038/nn.2672. PMC 3324277. PMID 20975758. ^ Sun J, Sun J, Ming GL, Song H (Mar 2011). "Epigenetic regulation of neurogenesis in the adult mammalian brain". The European Journal of Neuroscience. 33 (6): 1087–93. doi:10.1111/j.1460-9568.2011.07607.x. PMC 3076719. PMID 21395852. ^ Bird A (May 2007). "Perceptions of epigenetics". Nature. 447 (7143): 396–8. Bibcode:2007Natur.447..396B. doi:10.1038/nature05913. PMID 17522671. ^ "Overview of the Roadmap Epigenomics Project". ^ Mehler MF (Dec 2008). "Epigenetic principles and mechanisms underlying nervous system functions in health and disease". Progress in Neurobiology. 86 (4): 305–41. doi:10.1016/j.pneurobio.2008.10.001. PMC 2636693. PMID 18940229. ^ a b Maze I, Nestler EJ (Jan 2011). "The epigenetic landscape of addiction". Annals of the New York Academy of Sciences. 1216: 99–113. Bibcode:2011NYASA1216...99M. doi:10.1111/j.1749-6632.2010.05893.x. PMC 3071632. PMID 21272014. ^ Gottesman II, Hanson DR (2005). "Human development: biological and genetic processes". Annual Review of Psychology. 56: 263–86. doi:10.1146/annurev.psych.56.091103.070208. PMID 15709936. ^ a b c Campbell IC, Mill J, Uher R, Schmidt U (Jan 2011). "Eating disorders, gene-environment interactions and epigenetics". Neuroscience and Biobehavioral Reviews. 35 (3): 784–93. doi:10.1016/j.neubiorev.2010.09.012. PMID 20888360. ^ a b Goto T, Monk M (Jun 1998). "Regulation of X-chromosome inactivation in development in mice and humans". Microbiology and Molecular Biology Reviews. 62 (2): 362–78. PMC 98919. PMID 9618446. ^ Weaver IC, Cervoni N, Champagne FA, D'Alessio AC, Sharma S, Seckl JR, Dymov S, Szyf M, Meaney MJ (August 2004). "Epigenetic programming by maternal behavior". Nature Neuroscience. 7 (8): 847–54. doi:10.1038/nn1276. PMID 15220929. ^ a b c Kaminsky Z, Petronis A, Wang SC, Levine B, Ghaffar O, Floden D, Feinstein A (Feb 2008). "Epigenetics of personality traits: an illustrative study of identical twins discordant for risk-taking behavior". Twin Research and Human Genetics. 11 (1): 1–11. doi:10.1375/twin.11.1.1. PMID 18251670. ^ a b c d e f g h Masterpasqua F (2009). "Psychology and epigenetics". Review of General Psychology. 13 (3): 194–201. doi:10.1037/a0016301. ^ a b Szyf M, McGowan P, Meaney MJ (Jan 2008). "The social environment and the epigenome". Environmental and Molecular Mutagenesis. 49 (1): 46–60. doi:10.1002/em.20357. PMID 18095330. ^ González-Pardo H, Pérez Álvarez M (Feb 2013). "Epigenetics and its implications for Psychology". Psicothema. 25 (1): 3–12. doi:10.7334/psicothema2012.327. PMID 23336536. ^ Day JJ, Sweatt JD (Nov 2010). "DNA methylation and memory formation". Nature Neuroscience. 13 (11): 1319–23. doi:10.1038/nn.2666. PMC 3130618. PMID 20975755. ^ Fischer A, Sananbenesi F, Wang X, Dobbin M, Tsai LH (May 2007). "Recovery of learning and memory is associated with chromatin remodelling". Nature. 447 (7141): 178–82. Bibcode:2007Natur.447..178F. doi:10.1038/nature05772. PMID 17468743. ^ Gupta S, Kim SY, Artis S, Molfese DL, Schumacher A, Sweatt JD, Paylor RE, Lubin FD (Mar 2010). "Histone methylation regulates memory formation". The Journal of Neuroscience. 30 (10): 3589–99. doi:10.1523/JNEUROSCI.3732-09.2010. PMC 2859898. PMID 20219993. ^ Gräff J, Rei D, Guan JS, Wang WY, Seo J, Hennig KM, Nieland TJ, Fass DM, Kao PF, Kahn M, Su SC, Samiei A, Joseph N, Haggarty SJ, Delalle I, Tsai LH (Mar 2012). "An epigenetic blockade of cognitive functions in the neurodegenerating brain". Nature. 483 (7388): 222–6. Bibcode:2012Natur.483..222G. doi:10.1038/nature10849. PMC 3498952. PMID 22388814. ^ Peleg S, Sananbenesi F, Zovoilis A, Burkhardt S, Bahari-Javan S, Agis-Balboa RC, Cota P, Wittnam JL, Gogol-Doering A, Opitz L, Salinas-Riester G, Dettenhofer M, Kang H, Farinelli L, Chen W, Fischer A (May 2010). "Altered histone acetylation is associated with age-dependent memory impairment in mice". Science. 328 (5979): 753–6. Bibcode:2010Sci...328..753P. doi:10.1126/science.1186088. PMID 20448184. ^ a b c d e f Wong CC, Mill J, Fernandes C (Mar 2011). "Drugs and addiction: an introduction to epigenetics". Addiction. 106 (3): 480–9. doi:10.1111/j.1360-0443.2010.03321.x. PMID 21205049. ^ Andersen SL, Teicher MH (Apr 2009). "Desperately driven and no brakes: developmental stress exposure and subsequent risk for substance abuse". Neuroscience and Biobehavioral Reviews. 33 (4): 516–24. doi:10.1016/j.neubiorev.2008.09.009. PMC 2688959. PMID 18938197. ^ Carver C (2010). "Coping". In Baum A, Contrada RJ. The Handbook of Stress Science: Biology, Psychology, and Health. New York: Springer Publishing Company. p. 223. ISBN 978-0-8261-1471-6. ^ Renthal W, Nestler EJ (Aug 2008). "Epigenetic mechanisms in drug addiction". Trends in Molecular Medicine. 14 (8): 341–50. doi:10.1016/j.molmed.2008.06.004. PMC 2753378. PMID 18635399. ^ Naassila M (2011). "Abstracts of ESBRA 2011, European Society for Biomedical Research on Alcoholism. Vienna, Austria. September 4–7, 2011". Alcohol and Alcoholism. 46 Suppl 1 (Suppl 1): i1–63. doi:10.1093/alcalc/agr085. PMID 21863600. ^ Launay JM, Del Pino M, Chironi G, Callebert J, Peoc'h K, Mégnien JL, Mallet J, Simon A, Rendu F (2009). "Smoking induces long-lasting effects through a monoamine-oxidase epigenetic regulation". PLOS ONE. 4 (11): e7959. Bibcode:2009PLoSO...4.7959L. doi:10.1371/journal.pone.0007959. PMC 2775922. PMID 19956754. ^ Marlatt GA, Baer JS, Donovan DM, Kivlahan DR (1988). "Addictive behaviors: etiology and treatment". Annual Review of Psychology. 39: 223–52. doi:10.1146/annurev.ps.39.020188.001255. PMID 3278676. ^ Bönsch D, Lenz B, Reulbach U, Kornhuber J, Bleich S (Dec 2004). "Homocysteine associated genomic DNA hypermethylation in patients with chronic alcoholism". Journal of Neural Transmission. 111 (12): 1611–6. doi:10.1007/s00702-004-0232-x. PMID 15565495. ^ He F, Lidow IA, Lidow MS (2006). "Consequences of paternal cocaine exposure in mice". Neurotoxicology and Teratology. 28 (2): 198–209. doi:10.1016/j.ntt.2005.12.003. PMID 16458479. ^ Raney TJ, Thornton LM, Berrettini W, Brandt H, Crawford S, Fichter MM, Halmi KA, Johnson C, Kaplan AS, LaVia M, Mitchell J, Rotondo A, Strober M, Woodside DB, Kaye WH, Bulik CM (May 2008). "Influence of overanxious disorder of childhood on the expression of anorexia nervosa". The International Journal of Eating Disorders. 41 (4): 326–32. doi:10.1002/eat.20508. PMID 18213688. ^ Mostafavi-Abdolmaleky H, Glatt SJ, Tsuang MT (2011). "Epigenetics in Psychiatry". In Bronner F, Helmtrud I. Epigenetic Aspects of Chronic Diseases. Berlin: Springer. pp. 163–174. ISBN 978-1-84882-643-4. ^ a b c Abdolmaleky HM, Thiagalingam S, Wilcox M (2005). "Genetics and epigenetics in major psychiatric disorders: dilemmas, achievements, applications, and future scope". American Journal of Pharmacogenomics. 5 (3): 149–60. doi:10.2165/00129785-200505030-00002. PMID 15952869. ^ Malaspina D, Harlap S, Fennig S, Heiman D, Nahon D, Feldman D, Susser ES (Apr 2001). "Advancing paternal age and the risk of schizophrenia". Archives of General Psychiatry. 58 (4): 361–7. doi:10.1001/archpsyc.58.4.361. PMID 11296097. ^ a b c d e f Rutten BP, Mill J (Nov 2009). "Epigenetic mediation of environmental influences in major psychotic disorders". Schizophrenia Bulletin. 35 (6): 1045–56. doi:10.1093/schbul/sbp104. PMC 2762629. PMID 19783603. ^ Yauk C, Polyzos A, Rowan-Carroll A, Somers CM, Godschalk RW, Van Schooten FJ, Berndt ML, Pogribny IP, Koturbash I, Williams A, Douglas GR, Kovalchuk O (Jan 2008). "Germ-line mutations, DNA damage, and global hypermethylation in mice exposed to particulate air pollution in an urban/industrial location". Proceedings of the National Academy of Sciences of the United States of America. 105 (2): 605–10. Bibcode:2008PNAS..105..605Y. doi:10.1073/pnas.0705896105. PMC 2206583. PMID 18195365. ^ McGowan PO, Kato T (Jan 2008). "Epigenetics in mood disorders". Environmental Health and Preventive Medicine. 13 (1): 16–24. doi:10.1007/s12199-007-0002-0. PMC 2698240. PMID 19568875. ^ Abdolmaleky HM, Cheng KH, Faraone SV, Wilcox M, Glatt SJ, Gao F, Smith CL, Shafa R, Aeali B, Carnevale J, Pan H, Papageorgis P, Ponte JF, Sivaraman V, Tsuang MT, Thiagalingam S (Nov 2006). "Hypomethylation of MB-COMT promoter is a major risk factor for schizophrenia and bipolar disorder". Human Molecular Genetics. 15 (21): 3132–45. doi:10.1093/hmg/ddl253. PMC 2799943. PMID 16984965. ^ Dempster EL, Mill J, Craig IW, Collier DA (2006). "The quantification of COMT mRNA in post mortem cerebellum tissue: diagnosis, genotype, methylation and expression". BMC Medical Genetics. 7: 10. doi:10.1186/1471-2350-7-10. PMC 1456954. PMID 16483362. ^ Massart R, Mongeau R, Lanfumey L (Sep 2012). "Beyond the monoaminergic hypothesis: neuroplasticity and epigenetic changes in a transgenic mouse model of depression". Philosophical Transactions of the Royal Society of London. Series B, Biological Sciences. 367 (1601): 2485–94. doi:10.1098/rstb.2012.0212. PMC 3405682. PMID 22826347. ^ Pariante CM, Lightman SL (Sep 2008). 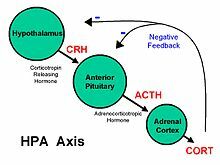 "The HPA axis in major depression: classical theories and new developments". Trends in Neurosciences. 31 (9): 464–8. doi:10.1016/j.tins.2008.06.006. PMID 18675469. ^ Tsankova NM, Berton O, Renthal W, Kumar A, Neve RL, Nestler EJ (Apr 2006). "Sustained hippocampal chromatin regulation in a mouse model of depression and antidepressant action". Nature Neuroscience. 9 (4): 519–25. doi:10.1038/nn1659. PMID 16501568. ^ Gray JD, Milner TA, McEwen BS (Jun 2013). "Dynamic plasticity: the role of glucocorticoids, brain-derived neurotrophic factor and other trophic factors". Neuroscience. 239: 214–27. doi:10.1016/j.neuroscience.2012.08.034. PMC 3743657. PMID 22922121. ^ Hunter RG (2012). "Epigenetic effects of stress and corticosteroids in the brain". Frontiers in Cellular Neuroscience. 6: 18. doi:10.3389/fncel.2012.00018. PMC 3329877. PMID 22529779. ^ Jiang Y, Langley B, Lubin FD, Renthal W, Wood MA, Yasui DH, Kumar A, Nestler EJ, Akbarian S, Beckel-Mitchener AC (Nov 2008). "Epigenetics in the nervous system". The Journal of Neuroscience. 28 (46): 11753–9. doi:10.1523/JNEUROSCI.3797-08.2008. PMID 19005036. ^ Philibert RA, Beach SR, Gunter TD, Brody GH, Madan A, Gerrard M (Mar 2010). "The effect of smoking on MAOA promoter methylation in DNA prepared from lymphoblasts and whole blood". American Journal of Medical Genetics Part B. 153B (2): 619–28. doi:10.1002/ajmg.b.31031. PMC 3694401. PMID 19777560. ^ Philibert RA, Sandhu H, Hollenbeck N, Gunter T, Adams W, Madan A (Jul 2008). "The relationship of 5HTT (SLC6A4) methylation and genotype on mRNA expression and liability to major depression and alcohol dependence in subjects from the Iowa Adoption Studies". American Journal of Medical Genetics Part B. 147B (5): 543–9. doi:10.1002/ajmg.b.30657. PMC 3643119. PMID 17987668. ^ Philibert RA, Gunter TD, Beach SR, Brody GH, Madan A (Jul 2008). "MAOA methylation is associated with nicotine and alcohol dependence in women". American Journal of Medical Genetics Part B. 147B (5): 565–70. doi:10.1002/ajmg.b.30778. PMC 3685146. PMID 18454435. ^ Bodnar RJ (Dec 2010). "Endogenous opiates and behavior: 2009". Peptides. 31 (12): 2325–59. doi:10.1016/j.peptides.2010.09.016. PMC 2693002. PMID 20875476. ^ Mill J, Petronis A (Oct 2008). "Pre- and peri-natal environmental risks for attention-deficit hyperactivity disorder (ADHD): the potential role of epigenetic processes in mediating susceptibility". Journal of Child Psychology and Psychiatry, and Allied Disciplines. 49 (10): 1020–30. doi:10.1111/j.1469-7610.2008.01909.x. PMID 18492038. ^ Gunter TD, Vaughn MG, Philibert RA (2010). "Behavioral genetics in antisocial spectrum disorders and psychopathy: a review of the recent literature". Behavioral Sciences & the Law. 28 (2): 148–73. doi:10.1002/bsl.923. PMID 20422643. ^ a b McGowan PO, Sasaki A, D'Alessio AC, Dymov S, Labonté B, Szyf M, Turecki G, Meaney MJ (Mar 2009). "Epigenetic regulation of the glucocorticoid receptor in human brain associates with childhood abuse". Nature Neuroscience. 12 (3): 342–8. doi:10.1038/nn.2270. PMC 2944040. PMID 19234457. ^ Herb BR, Wolschin F, Hansen KD, Aryee MJ, Langmead B, Irizarry R, Amdam GV, Feinberg AP (Oct 2012). "Reversible switching between epigenetic states in honeybee behavioral subcastes". Nature Neuroscience. 15 (10): 1371–3. doi:10.1038/nn.3218. PMC 3518384. PMID 22983211. ^ Kucharski R, Maleszka J, Foret S, Maleszka R (Mar 2008). "Nutritional control of reproductive status in honeybees via DNA methylation". Science. 319 (5871): 1827–30. doi:10.1126/science.1153069. PMID 18339900. ^ Li-Byarlay H, Li Y, Stroud H, Feng S, Newman TC, Kaneda M, Hou KK, Worley KC, Elsik CG, Wickline SA, Jacobsen SE, Ma J, Robinson GE (Jul 2013). "RNA interference knockdown of DNA methyl-transferase 3 affects gene alternative splicing in the honey bee". Proceedings of the National Academy of Sciences of the United States of America. 110 (31): 12750–5. doi:10.1073/pnas.1310735110. PMC 3732956. PMID 23852726. ^ a b c Albert PR (Nov 2010). "Epigenetics in mental illness: hope or hype?". Journal of Psychiatry & Neuroscience. 35 (6): 366–8. doi:10.1503/jpn.100148. PMC 2964366. PMID 20964959. ^ McCaffery JM (2010). "Genetic epidemiology of stress and gene by stress interaction". In Baum A, Contrada RJ. The Handbook of Stress Science: Biology, Psychology, and Health. New York: Springer Publishing Company. pp. 78–85. ISBN 978-0-8261-1471-6. ^ a b Kalant H (May 2010). "What neurobiology cannot tell us about addiction". Addiction. 105 (5): 780–9. doi:10.1111/j.1360-0443.2009.02739.x. PMID 19919596. ^ a b Guo G (2010). "Family influences on children's well being: potential roles of molecular genetics and epigenetics". In Landale N, Booth A, McHale S. Biosocial Foundations of Family Processes (National Symposium on Family Issues). Berlin: Springer. pp. 181–204. ISBN 978-1-4419-7360-3. ^ Dempster EL, Pidsley R, Schalkwyk LC, Owens S, Georgiades A, Kane F, Kalidindi S, Picchioni M, Kravariti E, Toulopoulou T, Murray RM, Mill J (Dec 2011). "Disease-associated epigenetic changes in monozygotic twins discordant for schizophrenia and bipolar disorder". Human Molecular Genetics. 20 (24): 4786–96. doi:10.1093/hmg/ddr416. PMC 3221539. PMID 21908516. Lester BM, Tronick E, Nestler E, Abel T, Kosofsky B, Kuzawa CW, Marsit CJ, Maze I, Meaney MJ, Monteggia LM, Reul JM, Skuse DH, Sweatt JD, Wood MA (May 2011). "Behavioral epigenetics". Annals of the New York Academy of Sciences. 1226: 14–33. Bibcode:2011NYASA1226...14L. doi:10.1111/j.1749-6632.2011.06037.x. PMC 3783959. PMID 21615751. Champagne FA, Rissman EF (Mar 2011). "Behavioral epigenetics: a new frontier in the study of hormones and behavior". Hormones and Behavior. 59 (3): 277–8. doi:10.1016/j.yhbeh.2011.02.011. PMID 21419246. Nelson ED, Monteggia LM (Jul 2011). "Epigenetics in the mature mammalian brain: effects on behavior and synaptic transmission". Neurobiology of Learning and Memory. 96 (1): 53–60. doi:10.1016/j.nlm.2011.02.015. PMC 3463371. PMID 21396474. Plazas-Mayorca MD, Vrana KE (Jan 2011). "Proteomic investigation of epigenetics in neuropsychiatric disorders: a missing link between genetics and behavior?". Journal of Proteome Research. 10 (1): 58–65. doi:10.1021/pr100463y. PMC 3017635. PMID 20735116. Curley JP, Jensen CL, Mashoodh R, Champagne FA (Apr 2011). "Social influences on neurobiology and behavior: epigenetic effects during development". Psychoneuroendocrinology. 36 (3): 352–71. doi:10.1016/j.psyneuen.2010.06.005. PMC 2980807. PMID 20650569. Crews D (Mar 2011). "Epigenetic modifications of brain and behavior: theory and practice". Hormones and Behavior. 59 (3): 393–8. doi:10.1016/j.yhbeh.2010.07.001. PMC 3401366. PMID 20633562. Mann JJ, Currier DM (Jun 2010). "Stress, genetics and epigenetic effects on the neurobiology of suicidal behavior and depression". European Psychiatry. 25 (5): 268–71. doi:10.1016/j.eurpsy.2010.01.009. PMC 2896004. PMID 20451357. Crews D (2010). "Epigenetics, brain, behavior, and the environment". Hormones. 9 (1): 41–50. doi:10.14310/horm.2002.1251. PMID 20363720. Malvaez M, Barrett RM, Wood MA, Sanchis-Segura C (2009). "Epigenetic mechanisms underlying extinction of memory and drug-seeking behavior". Mammalian Genome. 20 (9–10): 612–23. doi:10.1007/s00335-009-9224-3. PMC 3157916. PMID 19789849. Nicolaïdis S (Oct 2008). "Prenatal imprinting of postnatal specific appetites and feeding behavior". Metabolism. 57 Suppl 2: S22–6. doi:10.1016/j.metabol.2008.07.004. PMID 18803961. McGowan PO, Meaney MJ, Szyf M (Oct 2008). "Diet and the epigenetic (re)programming of phenotypic differences in behavior". Brain Research. 1237: 12–24. doi:10.1016/j.brainres.2008.07.074. PMC 2951010. PMID 18694740. Szyf M, Weaver I, Meaney M (Jul 2007). "Maternal care, the epigenome and phenotypic differences in behavior". Reproductive Toxicology. 24 (1): 9–19. doi:10.1016/j.reprotox.2007.05.001. PMID 17561370. Bonasio R, Zhang G, Ye C, Mutti NS, Fang X, Qin N, Donahue G, Yang P, Li Q, Li C, Zhang P, Huang Z, Berger SL, Reinberg D, Wang J, Liebig J (Aug 2010). "Genomic comparison of the ants Camponotus floridanus and Harpegnathos saltator". Science. 329 (5995): 1068–71. Bibcode:2010Sci...329.1068B. doi:10.1126/science.1192428. PMC 3772619. PMID 20798317. Lay summary – Scientific American (August 26, 2010). McDonald B (2011). "The Fingerprints of Poverty". Quirks & Quarks. CBC Radio. Audio interview with Moshe Szyf, a professor of Pharmacology and Therapeutics at McGill University, discusses how epigenetic changes are related to differences in socioeconomic status. Oz M (2011). "Control Your Pregnancy". The Dr. Oz Show. Video explaining how epigenetics can affect the unborn fetus. Paylor B (2010). "Epigenetic Landscapes". Archived from the original on 2013-12-15. 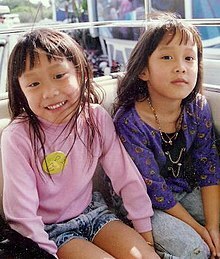 This video addresses how, in principle, accumulated epigenetic changes may result in personality differences in identical twins. This video was made by a Ph.D. candidate in experimental medicine and award winning filmmaker Ben Paylor. Rusting R (2011). "Epigenetics Explained (Animation)". Scientific American. 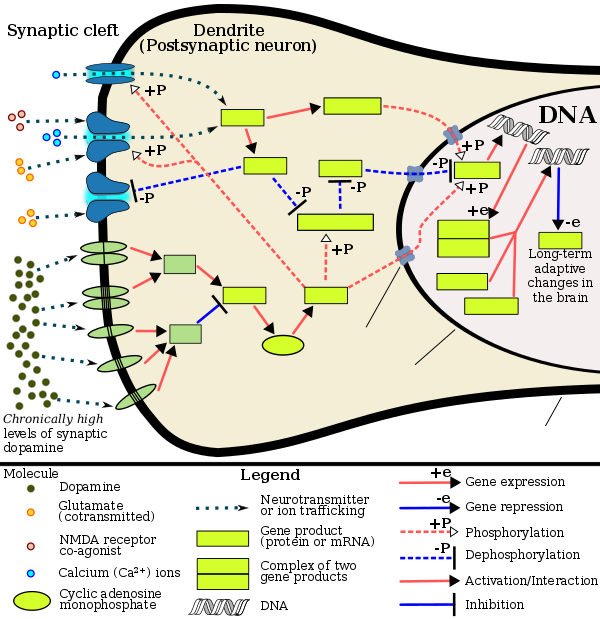 A series of diagrams explaining how epigenetic marks affect genetic expression. This page was last edited on 27 February 2019, at 01:10 (UTC).